At 7:10 p.m. ET, ESPN veteran play-by-play announcer Beth Mowins will call the New York Jets-Detroit Lions game with analyst Brian Griese and sideline reporter Laura Rutledge. At 10:15 p.m. ET, MNF’s new commentator team of play-by-play voice Joe Tessitore, analysts Jason Witten and Booger McFarland and sideline reporter Lisa Salters (returning for her seventh MNF season) will call the Los Angeles Rams-Oakland Raiders game as former MNF analyst Jon Gruden (2009-17) makes his NFL coaching return. MNF rules analyst Jeff Triplette will work with the new commentator team throughout the season. In Week 2, Monday Night Football will kick off at its new weekly time of 8:15 p.m. ET. SUNDAY NFL COUNTDOWN (10 a.m. ET, ESPN) returns Sept. 9 with host Sam Ponder, analysts Matt Hasselbeck, Randy Moss, Rex Ryan and Charles Woodson, insiders Chris Mortensen and Adam Schefter, front office insider Louis Riddick and senior fantasy sports analyst Matthew Berry. The following reporters will provide updates from game sites: Josina Anderson, Jeff Darlington, Dan Graziano, Sal Paolantonio, Dianna Russini and Michele Steele, and Jac Collinsworth will contribute features. MONDAY NIGHT COUNTDOWN (5 p.m. ET*, ESPN) returns Sept. 10 with host Suzy Kolber and analysts Matt Hasselbeck, Randy Moss, Charles Woodson and Steve Young reviewing Week 1 action and previewing the MNF doubleheader from Jack London Square in Oakland. Insiders Chris Mortensen and Adam Schefter and senior fantasy sports analyst Matthew Berry will join the show from ESPN’s Bristol Conn., studios. Additionally, Chris Berman and Michelle Beisner-Buck will contribute features throughout the season, and new this year, Louis Riddick will join Kolber and Young for halftime and post-game shows. *In Week 2, Monday Night Countdown will return to its normal start time of 6 p.m. ET. FANTASY FOOTBALL NOW (Sundays at 10 a.m. ET, ESPN2) returns Sept. 9 with a new host in Molly Qerim Rose and originating from a new studio on ESPN’s Bristol, Conn., campus. The award-winning three-hour fantasy football show is packed with insights from trusted analysts Matthew Berry, Tim Hasselbeck, Field Yates, Stephania Bell and Mike Clay. Fantasy Football Now also includes the latest injury reports, live updates from NFL stadiums and answers to fan questions submitted with the hashtag #FFNow. NFL Live (Mondays at 2:30 p.m. ET on ESPN; Tue-Fri at 1:30 p.m. ET on ESPN): Wendi Nix, Suzy Kolber and Jac Collinsworth rotate as host. Contributors include: Josina Anderson, Tedy Bruschi, Ryan Clark, Victor Cruz, Jeff Darlington, John Fox, Dan Graziano, Tim Hasselbeck, Andrew Hawkins, Chris Mortensen, Dan Orlovsky, Bill Polian, Louis Riddick, Dianna Russini, Jeff Saturday, Adam Schefter, Darren Woodson, Damien Woody, Field Yates and Steve Young. NFL Matchup (Sundays at 4 and 6:30 a.m. ET on ESPN): Sal Paolantonio hosts (for the 17th year) with analysts Greg Cosell and Matt Bowen, the ESPN.com writer and former NFL player who joins the show this fall. NFL PrimeTime (Mondays at 1:30 p.m. ET on ESPN): Trey Wingo hosts with NFL analysts Tim Hasselbeck and Jeff Saturday. The Fantasy Show with Matthew Berry (Mondays, Tuesdays and Thursdays at 6 p.m. ET on ESPN+): Matthew Berry is joined by Daniel Dopp and their unconventional cast of characters. SportsCenter will debut a new 90-minute Monday Night Football edition beginning Sept. 10 at noon ET. Hosts Hannah Storm and Jay Harris will deliver the news of the day with a focus on the night’s matchup. Every Sunday night following the final NFL game, Scott Van Pelt will interview some of the biggest playmakers of the day and break down key plays with analyst Ryan Clark. Van Pelt will also debut a weekly segment with new Monday Night Football analyst Jason Witten, and Tim Hasselbeck will join Van Pelt on his post-MNF edition this year. ESPN NFL programming such as Sunday NFL Countdown, Monday Night Countdown, Monday Night Football, NFL Live and more will also be available to stream live on the ESPN App. Fans with an affiliated pay TV subscription can access content on computers, tablets, smartphones and connected streaming devices. Additionally, ESPN+ subscribers will receive exclusive access to the latest episodes of The Fantasy Show with Matthew Berry throughout the season, featuring a daily mix of news, analysis and special guests to help fantasy football players win their leagues. ESPN Deportes will present live coverage of 17 regular season MNF games – including the Kansas City Chiefs-Los Angeles Rams game at Estadio Azteca in Mexico City on November 19, a Wild Card playoff game, the Pro Bowl and will cap the season with exclusive Spanish-language coverage of Super Bowl LIII on Sunday, February 3, 2019. For the 16th season, Alvaro Martín (play-by-play) and Super Bowl XXI champion Raul Allegre (analyst) will call the NFL on ESPN Deportes with reporter John Sutcliffe. Again this season, the ESPN Deportes Spanish-language telecast will be simulcast on ESPN2 in weeks 1-9. Presentations of MNF on ESPN Deportes and ESPN2 will be preceded by an NFL Esta Noche pregame at 8 p.m. ET (beginning in Week 2) with Eduardo Varela, Pablo Viruega and John Sutcliffe. ESPN Deportes’ Spanish-language presentations of MNF, as well as Thanksgiving games (ESPN Deportes Radio only) and the Pro Bowl and Super Bowl LIII will also be live-streamed via the ESPN App and available on ESPN Deportes Radio with Kenneth Garay and Sebastian Martinez Christensen as the lead commentator team. Additionally, ESPNdeportes.com will present extensive coverage throughout the season, including exclusive online content for all 17 MNF games. The No. 1 most popular fantasy football game, ESPN Fantasy Football has begun its 23rd season with enhanced game play and expanded content on the ESPN Fantasy App and ESPN.com, along with the fantasy sports industry’s most comprehensive collection of expert analysis, news, statistical data, and tools across app, web, television, and audio. More information. ESPN Radio will again broadcast out-of-market NFL games, beginning Sunday, Sept. 9, with a doubleheader – Jacksonville Jaguars at New York Giants (Noon ET) and Seattle Seahawks at Denver Broncos (4 p.m.). Commentators include play-by-play announcers Adam Amin and Marc Kestecher and analysts Bill Polian, Chris Canty, Brock Huard and Shaun O’Hara. All ESPN Radio shows will welcome weekly expert analysts to discuss the NFL, including Golic and Wingo, which will feature Jason Witten (Mondays), Joe Thomas (Tuesdays), Tom Waddle (Wednesdays), Chris Canty (Thursdays), Tedy Bruschi (Fridays) and more. 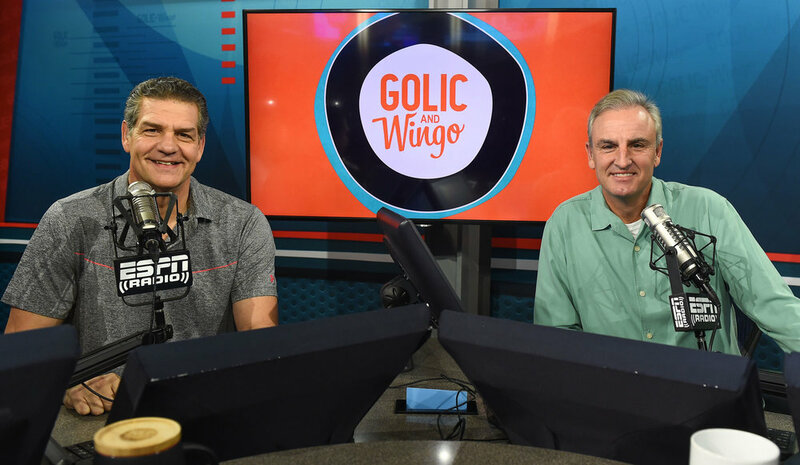 Golic and Wingo will also tour the country as part of ESPN Radio’s annual Fall Football Tour beginning Friday, Sept. 7 in Green Bay to preview the weekend’s Bears-Packers matchup. ESPN Radio kicked off a new fall football-themed weekend lineup on Sept. 2, highlighted by Randy Scott hosting Operation Football with Andrew Hawkins and Field Yates, Football Friendzy hosted by former Bachelorette Rachel Lindsay, with Bobby Carpenter and Yates. The Locker Room Show will recap the day in the NFL with former NFL players Geoff Schwartz, Kirk Morrison and Barrett Jones.